Brisbane’s Gateway upgrade project beat finalists from NSW and South Australia to win Australia’s best infrastructure project of the year. The $2.12 billion project, aimed at easing Brisbane’s traffic congestion, was presented with the title at Infrastructure Partnerships Australia’s (IPA) National Infrastructure Awards in Sydney last night. It is the result of a partnership between the Leighton-Abigroup Joint Venture, the Queensland Government and Queensland Motorways. Main Roads Minister Craig Wallace says the project was judged the country's best for its ‘iconic status, its engineering brilliance and sheer scale’. "This is Australia's biggest road and bridge project and it's now been crowned its best," says Wallace. "It was delivered on budget and an incredible seven months ahead of schedule." Wallace says the Sir Leo Hielscher bridges and the more than 20 kilometres of new and upgraded motorway have been a ‘shot in the arm’ for Queensland’s economy, creating over 5000 jobs during construction. Queensland Motorway Limited estimates the project has added more than $600 million to Gross Regional Product (GRP), including over $400 million to employment. Queensland Motorways Acting Chief Executive Officer John Gardiner says the project had been delivered quickly and without major impacts. "Queensland Motorways and our construction partners have maintained the existing network capacity throughout construction, rebuilding the Gateway Motorway day and night, to ensure that this vital artery continued to flow every day," he says. Gardiner says one of the keys to the project's success was the strength and professionalism of the team. "Queensland Motorways is rightly proud of its achievements and again I thank our team for a job well done," he says. "We forged strong working relationships with the State Government and contractor, Leighton Abigroup Joint Venture, to get the job done." With the project team beating its deadlines and budgets, the Queensland Government fast-tracked a final four kilometre extension to the project scope which is expected to be completed within the original project timeframe of mid-2011. This award is the second for the project, having won an Engineers Australia State Engineering Excellence Award in 2006 for its procurement phase. The Gateway Upgrade Project is a Queensland Government initiative being delivered by Queensland Motorways, with design, construction and maintenance by the Leighton Abigroup Joint Venture. 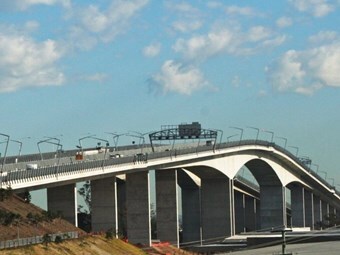 The project involves duplication of the Sir Leo Hielscher Bridge with 16km of upgrades to the Gateway Motorway south to the Pacific Motorway and 7km of new motorway north to Nudgee Road. The upgrade of the last remaining four-lane section on the Gateway Motorway between Mt Gravatt-Capalaba Road and Miles Platting Road from four lanes to six lanes, plus asphalt overlay to the Pacific Motorway, is due for completion by mid-2011.